You are here: Home / articles and blogs / How to Write For Magazines: 8 Keys to Getting Published! 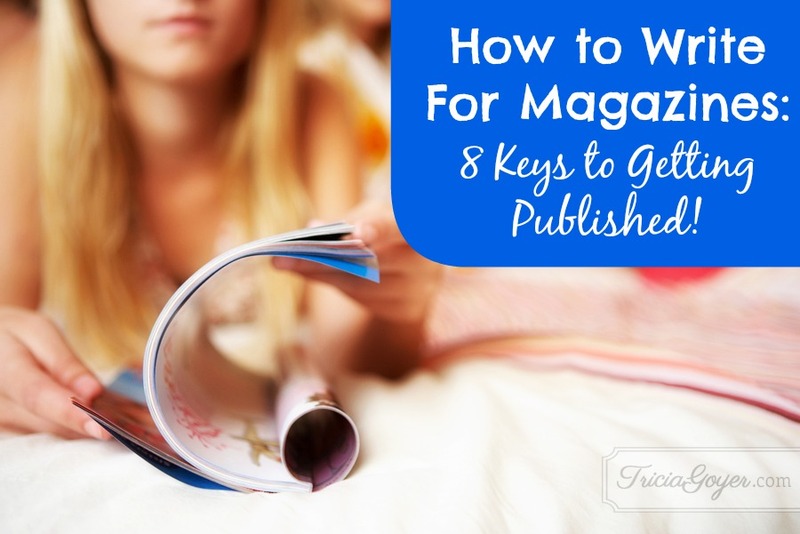 How to Write For Magazines: 8 Keys to Getting Published! Years ago I took a workshop on writing for magazines. I took the best tips I learned there, and I’m sharing them with you. Following these tips I sold thirty articles to national publications in one year. Maybe you can do the same! My start as a writer came through writing articles. There are magazines that target thousands of audiences and markets, and they are on the lookout for writers who know their audience and their style and have a good story or idea to share! Magazines go to press regularly, and they are always looking for fresh talent. More than that, magazines give you credibility as a writer. Have a book proposal on being a better parent that you’re trying to pitch? Your proposal might be great, but I guarantee you’ll get more interest from the publisher if you have some nice magazine spreads with your byline on it. This proves to publishers that your topic is relevant and desirable, that you know how to work with editors, and that you can write! Do you have ideas that would make good articles? Here are eight keys to getting published! 1. Pick Your Topic. Consider what you want to write about. What are you passionate about? What do you find yourself talking about often? 3. Study the Magazines. Get a copy of the magazines you’ve targeted and study them. The majority of publications have online articles for you to look at. Look at the length of the articles. Check out how they start (statistics, personal story, fact, hook?). How can you angle your topic to fit into their style? 4. Become Best Friends with a Market Guide. Look through the Christian Writer’s Market Guide. Find information about the magazines you want to write for. This guide gives you detailed facts about the publication, who to contact, what they are looking for, and if they’d like to see a query or the completed article first. You can also find new publications that might need exactly what you want to write! 5. Scrutinize the Layout. Ask, “How are the articles laid out?” (With sub-headers? With bullet points? With stories or quotes from others?) If you read through the publications’ articles, a style will start to come through. 6. Tailor-Fit Your Piece. Instead of writing one article, look at numerous magazines and figure out how your topic could fit for each of them. Think of this as knitting a sweater. Instead of knitting a simple sweater and sending it around to see what publication it will fit, think about each magazine as an entity who wants a sweater, BUT they want one that will fit them perfectly. The style, fit, form, etc., is unique to each publication. 7. Study Writers’ Guidelines. Each publication has writers guidelines. Find them, study them, follow them. Magazines will let you know exactly what they want to see. Give them what the want and you’ll go far! You can search for thousands of guidelines here. 8. Writer a Killer Query or Article. You can do all the behind-the-scenes work, but nothing beats good writing. There are great books on how to write well . . . read them! Here’s a great article, too, with some important points on magazine writing. Ready to get started? I guarantee if you take these tools and follow them you’ll soon find yourself published in magazines, too! Thank you for the great tips! I am pinning this article. You are a so dear! I’m glad it can help! Thank you for the article is wonderful ,Ive always dreamed with being a writer , english is not my native language wich kind of complicate things for me , even though spanish is my native language I find it more difficult because unfortunately I feel people does not have the same habit of reading in hispanic culture as they do in other countries like USA or Europe , but I will keep on trying becuase this reminded me what has been one of my biggest dream in life ,thank you so much for the inspiration !!! I know you can be used in wonderful ways, Alma. Keep going! I just wanted to say thank you! I first heard of you while participating in a homeschool expo, where you were one of the speakers, about five years ago. You have always been an inspiration to me. I recently came into contact with one of your articles and your website that reignited my love of writing. I used to write children’s stories (never having any of them published) but shelved that dream more than twenty years ago. When I recently read one of your articles, it gave me a sort of confidence in which I thought I could write again! And this time I would get published! Oh and the other day my husband and I were in Wal-Mart in the book and magazine aisle. I looked down and saw a book that you authored (sorry I don’t remember the name of it but I believe it was with four other authors — perhaps several books in one?) and told my husband, “See this is the lady that I was telling you about!” I told him all about you and your background and how you inspired me to write again. I also told him that you are in Little Rock (we live about three hours north of you near Harrison.) So, again, thank you! Cynthia, do it. Do it!! It sounds like God is TELLING you something! I love that! I’m so glad he’s using me to inspire you! If you’re interested in writing fiction check out ACFW.com … they’re an awesome Christian organization dedicated to helping fiction writers. The book you saw was, “An Amish Garden.” Yes, it was written with three other authors. It was great hearing from you! Keep me updated! Yes, that was the book! I do like to write fiction and I will check out that website. I also have this idea rolling around in my head regarding my life experience of infertility and adoption. After adopting our son at birth eight years ago, I found out that I was FINALLY pregnant (for the first time) and by the time our daughter was born I had been trying to conceive and have a baby for over 17 years! Now, seven years later and trying for over 23 years, at the age of 41, I’m still wanting another baby. But again haven’t been able to have another one (had an ectopic almost five years ago and lost my good tube) so we are considering private adoption again. But, I’m just not sure how to go about it or what angle to write it. Trying to figure out if it’s something that needs to be a book or an article in a magazine. Or wondering if it’s even anything anyone would have an interest in. Needless to say, I have a lot to figure out! LOL! God will show you the way! You might want to start with a blog … to get all the words out! I’ve always been intrigued with blogs, but I don’t have the faintest idea as to how to do one! 🙂 Perhaps it’s something to look into! Thank you for the idea! Great source for writing magazines.